← What’s going on at WH Smith? The recent news that McDonald’s is recruiting an army of friendly bloggers in the US to write positive stories about it should come as no surprise. Indeed it tested the water in 2010 when it invited 15 bloggers to its HQ in Chicago. This latest effort appears to have two drivers: firstly, a desire to counter activity in social media such as Twitter and Facebook, which it cannot control, where negative stories about it such as its ‘pink slime’ food additive were being circulated. The second driver seems to have come out of a failed attempt to successfully harness Twitter by paying to appear at the top of the trends list on Twitter’s home page to drive people to watch its new commercials online. Unsurprisingly, this backfired once McDonald’s antagonists found out about it. McDonalds has long been criticised on a range of issues, such as whether its food is healthy (cf Morgan Spurlock’s Supersize Me film), its marketing methods (targeting children via promos), and whether it is responsible for global warming as cattle ranchers clear large swathes of the Amazon rainforest. This battle is now online and the consumer rather than pressure groups now wields the power to harm the McDonald’s brand. What surprises me is that it has taken this long for McDonald’s to do this. No doubt, other big consumer brands will follow – McDonald’s isn’t the only big brand to have fallen foul of the power of the consumer in social networks recently. Earlier this year there was a fuss when Mars used celebrities to tweet about its Snickers bar. McDonald’s latest action can be seen as just one move in the game of chess that brands are playing with consumers in social media. This chess metaphor has some traction. Brands have made their initial moves, and as well as taking chess pieces (having social media successes) they have sometimes lost them too – and spectacularly so. Readers should recall the early social media disasters encountered by United Airlines (United breaks guitars) and Dell (‘Dell Hell’). So the early part of the game, the skirmishing phase if you like, is over. 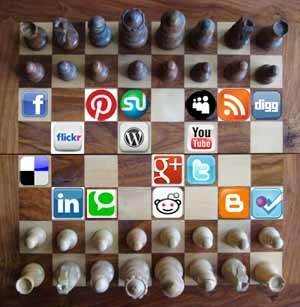 I suggest we are in the mid-phase of the chess game where brands are developing strategies that work for them. – Posting a viral video (awareness). – Engaging with consumers in social networks (lack of WOM). – Creating specific online communities (accessibility). Thus Blendtec’s ‘Will it blend?’ campaign via YouTube has been extremely successful in raising awareness (and increasing sales) of a high-end range of kitchen blenders. In 2009 Burger King developed a ‘Whopper Sacrifice’ Facebook application whereby members were asked to ‘unfriend’ 10 Facebook friends in return for a free burger. This initiative resulted in the unfriending of 234,000 friends who received alerts informing them they had been sacrificed for a Whopper. This campaign was enormously successful in engaging consumers and gaining notable WOM (oh, the irony of the unlikelihood of McDonald’s being able to do this successfully). On the blogging front, Sun Microsystems has for many years had hundreds of its employees blogging about its often complex products. And LEGO has the Lego Users Group Network (LUGNET), a global community of thousands of Lego enthusiasts, which acts as a support forum, as well as a co-creation platform. But not every channel works best for brands – clearly social networks aren’t for McDonald’s. So by identifying influential ‘mom bloggers’ and getting them to say positive things about them, McDonalds hopes to gain crucial WOM that they can’t otherwise obtain. So is McDonald’s example of recruiting this army of bloggers evidence of learning by experience by brands? I think so. But it remains to be seen whether mom bloggers such as Lindsay and Sojourner can make a difference for McDonald’s in the online space. There are plans to roll this out in the UK, where our more reserved culture might be less conducive to this kind of activity, but you have to agree it is worth trying. However, it was only a couple of years ago that commentators started saying that blogging is dead and that the future is Twitter and Facebook. How things come round. In this game of social media chess with the consumer, it is clear more now than ever that different strategies work for different brands and products. The latest buzz phrase that encompasses this concept seems to be social media influence marketing, with a good recent example being Ford which has teamed up with PeerIndex to incentivise influential people on Twitter and Facebook who post updates on cars and technology. Those interested visit a dedicated microsite and type in their Twitter name to get their PeerIndex score out of 100, with higher scores winning an exclusive prize. The sum of all this is that no one really can say with authority what works or doesn’t. Only the brand owners can find out. And it depends on how good they are at social media chess. This entry was posted in Branding, Social media and tagged Blogging, Fast food, McDonald's, Social media, social media influence marketing. Bookmark the permalink.